The moment has arrived to take our first look into SAP HANA Studio – the tool that help us create high performing data models for SAP HANA. This tool is a tweaked version of Eclipse which some of you might know for being widely used for Java development. 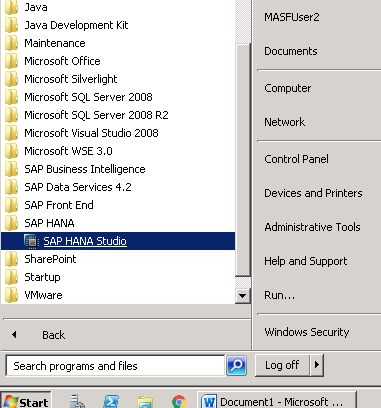 Finding SAP HANA Studio – Where is it? Let’s get right into it. 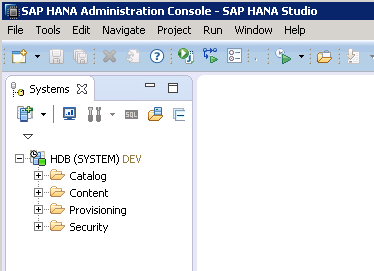 You can find HANA Studio in Start Menu -> All Programs -> SAP HANA -> SAP HANA Studio as shown below. Once you click on it, there should be a pop-up window asking for a workspace location. A workspace is nothing but a folder where all your offline work and configurations get saved. Enter a folder path and press Ok.
You would reach a screen like the below. It might be slightly different based on the service pack you have downloaded or if someone else modified the layout but don’t worry it doesn’t matter. Now, the first thing to understand about this tool is that different type of major tasks are performed in different areas or “Perspectives” as they are rightly called. Each perspective has a different purpose. 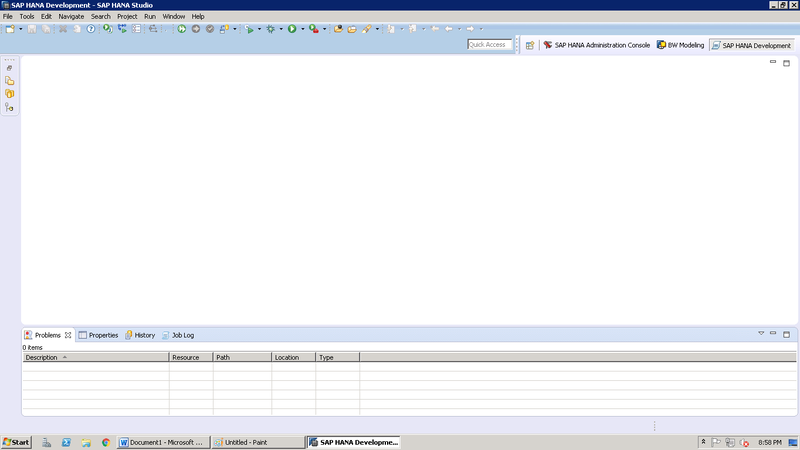 For example, “SAP HANA Administration Console perspective” is used by administrators for administration and monitoring of the HANA Database. 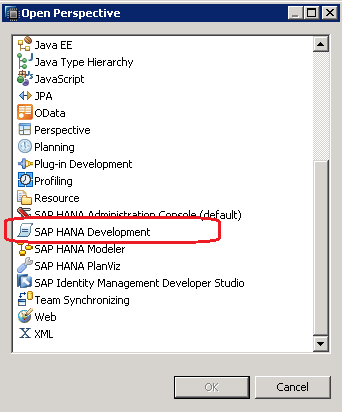 Similarly, “SAP HANA Development Perspective” is used for HANA model developments and other HANA related developments. There are many more perspectives but we would look at them as and when we need them. To do SAP HANA Development, you have two options, either use the “SAP HANA Development” Perspective or the “Modeler” Perspective. I recommend using the “SAP HANA Development” perspective as your default perspective and for all your HANA modeling needs as it allows you to create many more HANA related content like XS files, HDB tables etc. What are all of these things? Well.. if you are patient enough, we will learn them in some of the later tutorials. Let’s try moving to the Development Perspective for now. Navigate to the “Other” option in the context menu as shown below to get the list of all perspectives. Scroll down in this list and you will see the one we need. Click to select and press ok.
At this point you will see the SAP HANA Development perspective as current from the top right corner of the tool (Marked in the red arrow below). This part of the tool will always show you the three most recent perspectives you have been in and you can also click on one of these to switch to them if the one you need is already in this shortcut area. 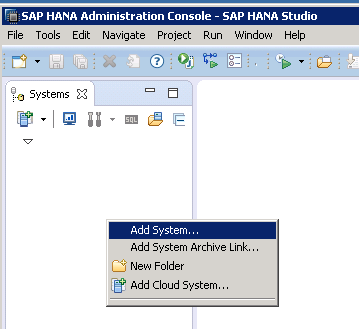 Now to connect to our HANA system from this tool, we need to go to the “Systems” pane which may or may not be visible to you at this point as sometimes it gets minimized. Click on the little squares (Marked in the blue arrow below) to expand this area. You will see the below Systems pane. Right click on the blank area inside this pane to add a new system by choosing “Add System” from the context menu as shown below. 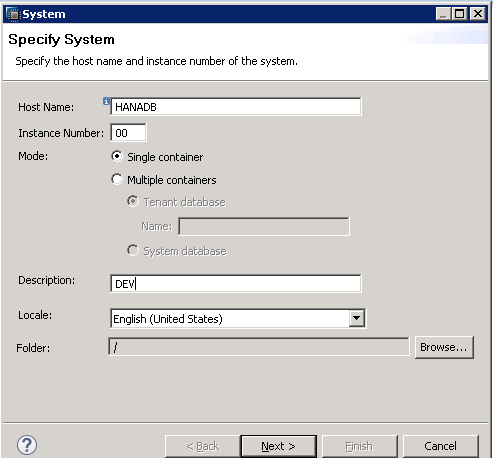 Fill in the Host Name and Instance number as provided by your system administrator and description as something relevant. The other settings may also be different depending on the database you connect to – Please check with your administrator for details. Press “Next” when done. The next step would be to enter in your username and password which also would be provided to you by your administrator. Press finish after you are done to add the systems. You will see that the system has been added and the green square on the system icon indicates that all services are working fine. Also, there are 4 sections or folder like icons that you see here. Let’s discuss their relevance. Catalog: This is where all the source metadata (Tables, views etc) is grouped under. Here you can do data previews on source system tables that have been replicated or available as virtual tables in case of SDA. Content: This is where all your HANA development takes place. The HANA models that you create go under here. Provisioning: This is mostly used for Smart data access. All the source systems connected via SDA will have their tables displayed here like a “Menu Card” in a restaurant. You can choose which one you want and build a virtual table for it in the “Catalog” section we discussed just now. Security: This is mostly for security consultants to maintain users and roles according to your role in the project – Developers, administrators, testers and so on. We will dwell deeper into these sections as we move further into these tutorials. Tagged analytics, hana, hana studio, hana training, sap, sap hana studio, sap hana tutorial, sap tutorial. 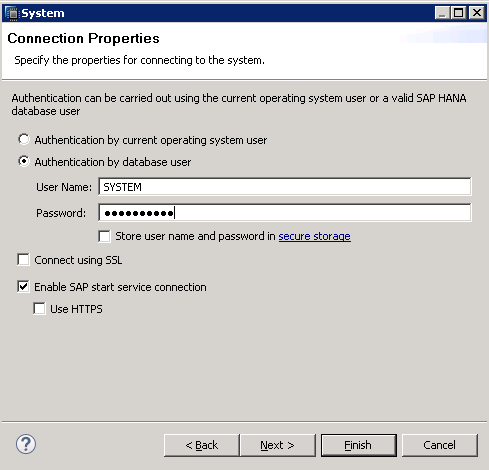 Where can I download SAP HANA STUDIO? SAP HANA Studio software is available on the SAP marketplace if you have an OSS ID (which your employer may be able to provide you with). Otherwise, you may buy the official trial access from https://aws.amazon.com/sap/offerings/. Please note that having SAP HANA studio software is not enough. You need a HANA database to connect to which can be provided by amazon for a cost or else you can buy the access from a lot of vendors online. Thanks! Please share a tutorial on social media to support the site. Nice article with great info. I had a question and seems you have nice knowledge about HANA Studio. Can you tell me whats the standout feature for SAP HANA Studio from Eclipse as all HANA tools can be installed on an Eclipse IDE. In other words why should someone opt for HANA Studio instead of Eclipse IDE. Its an amazing tutorial where people easily spend time and learn a technology. Thanks very much Shyamuthaman for your kind help. i share on facebook and linked-in. It is vry easy to understand here. Very informative…. keep up the good work! Amazing!! I really learnt a lot with the help of your tutorials and I am publicizing the same to everyone I know to check out your website. It’s very useful and i don’t meet other site as easy to learn like this.